Please see an article by Koichi Nagashima on what he calls a glocal approach to developing culture throughout the world. This article is written for architecture, however, it applies equally to other cultural realms. We look for interested people, who would like to develop our WClothesED project. Please see our Call for Creativity. The 2008 economic meltdown showed beyond doubt, and the ongoing climate crisis brings to the forefront continuously, that business practices around the world are in need of being dignified. Current practices tend to have humiliating effects on the world's socio- and biospheres. "Time Out For Fast Fashion Fast," is a call by Greenpeace to change the way we think about clothes. We, as Human Dignity and Humiliation Studies (HumanDHS) network, wish to contribute to ideas and projects that bring dignity into the world. Several of our ideas aim at developing new ways of transcending contemporary business practices. We usually begin by asking how fields such as that of fashion, for example, or of design, art, architecture, and so forth, can be dignified and how this can be done in ways that also dignify the very business practices that are applied in the process. To take clothes as an example, we begin our analysis with the observation that the diversity of human cultural styles is not very visible in contemporary daily worn clothes. On the contrary, fashion is dominated by a few centers in the West, and imitated around the world. When we look around today, we all wear more or less the same clothes, Western-designed clothes produced in low-cost countries. We would like to contribute to changing this situation. We, as HumanDHS, believe that cultural diversity should receive more respect and attention, which, in the case of clothing, means that the diverse cultural heritage in clothing that we find around the world should be valued more and made more visible in daily wear. At the current juncture in history, traditional clothes are typically worn only to festive occasions. We wish to integrate this heritage into future-orientated innovative and creative design for daily use. 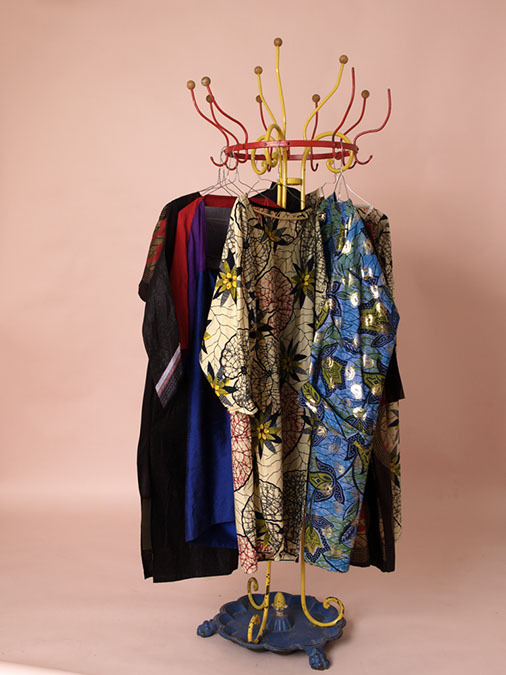 Starting about forty years ago, Evelin Lindner began making a collection of clothes that combine materials and styles from different cultures in original ways, thus giving dignity and visibility to the diversity of human clothing styles and embodying cross-cultural fertilization. It is envisioned to give away these clothes for donations. The donations are then envisioned to be fed into the activities of HumanDHS, particularly into research carried out by HumanDHS members (such as the funding of scholarships for doctoral students who study dignity and humiliation). We furthermore envision that the very process of promoting these products reflects our values. For example, we hope to connect the producer of a product with the buyer as fellow human beings, thus dignifying the process of production and nurturing global connections. Furthremore, we hope to offer our products together with information about personal cases where humiliation has been diminished and dignity increased. In this way a full circle is being performed: We start out from the idea of equality in dignity for all, then we envision developing products that express this idea, and we wish to promote these products in ways that express our values, and finally we close the circle by having the revenue feed back into research on the idea. Our World Clothes for Equal Dignity project is part of our quest to build bridges from social science to other areas of life. 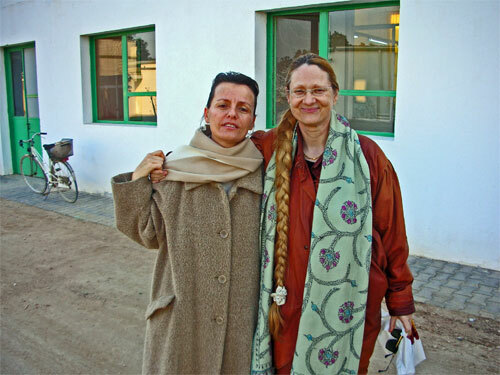 December 7, 2007, discussing our World Clothes for Equal Dignity idea with Zuzka! Zuzka confirmed that we need to educate people to respect the richness of knowledge and skill that flows into many handmade products, particularly those that honor long artistic traditions. On 30th March 2014, Evelin Lindner makes another attempt to inquire about silk and whether it is still being produced, and if yes, where. She learns that Takeo in Cambodia was the largest silk producer in the past according to a survey of the main silk producers located in Som Rong district, Barty district, Prey Karbas and Mongkol Borey district. On www.tpd.gov.kh one reads 'that the four main silk producing districts developed very fast in recent years under technical support from developing partners. Silk producers in 11 villages of Barty and Somrong district have formed the Takeo Silk Producer Community in order to facilitate technical assistance from various institutions. 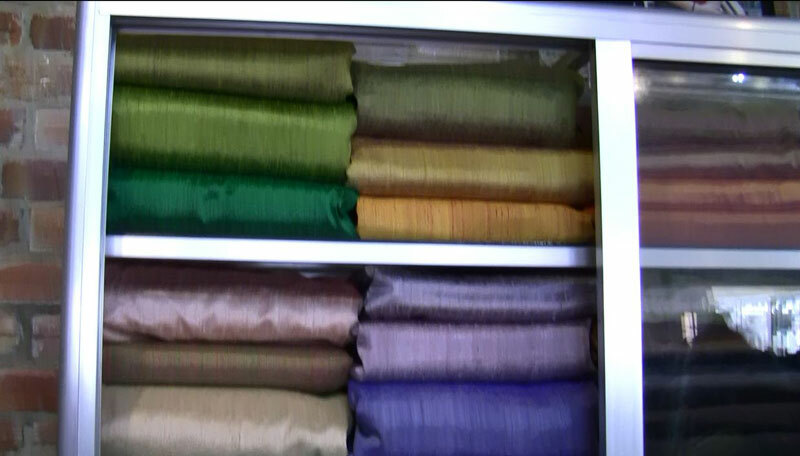 Production: 2,200 looms in four main districts, 90% of production is Samputh Hole, 10% of production are scarf and plain silks'. 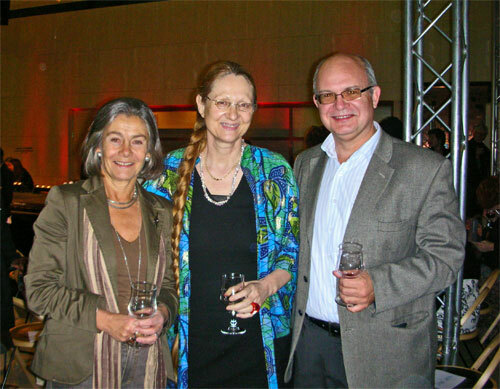 Linda Hartling, her husband Rick, and Evelin discussed this also with Nebil Basmaci, on 30th April 2010, at our 2010 Dignity Conference in Istanbul, when they attempted to enjoy the Covered Bazaar and unexpectedly had a very special conversation on the dignity - or rather the lack of dignity - in contemporary economic arrangements. In August 2016, my 1981 dress (see the photo on the left side) was copied in Sarajevo (on the right side)! In 1981, I worked as a medical student in Bangkok, and was overjoyed to see the streets filled with silk shops. I bought some silk and designed and made the dress you see on the left photo (the photo was taken in 2014). In 2014, I was back in Thailand and was devastated to see that modern-day mass production has "killed" the local silk handicraft, as it has done with so many other handicrafts all around the world. Those with means, in all corners of the world, seem to be willing now to reduce themselves to crowding their wardrobes with clothes that lack true quality and diversity. The number of colors that is being used in these mass-produced materials, just to give one example, is disastrously low. And I watch the poor, in Africa, South America, and other parts of the world, I watch them being reduced to digging through heaps of second-hand clothes that people in the Global North have given to "charity" believing that this meant "doing good," while these clothes are being sold off for profit, finally destroying also the local skill base among the poor. On December 7, 2007, I was discussing this disaster with Zuzka Kurtz in New York. Zuzka confirmed that we need to educate people to respect the richness of knowledge and skill that flows into many handmade products, particularly those that honor long artistic traditions. 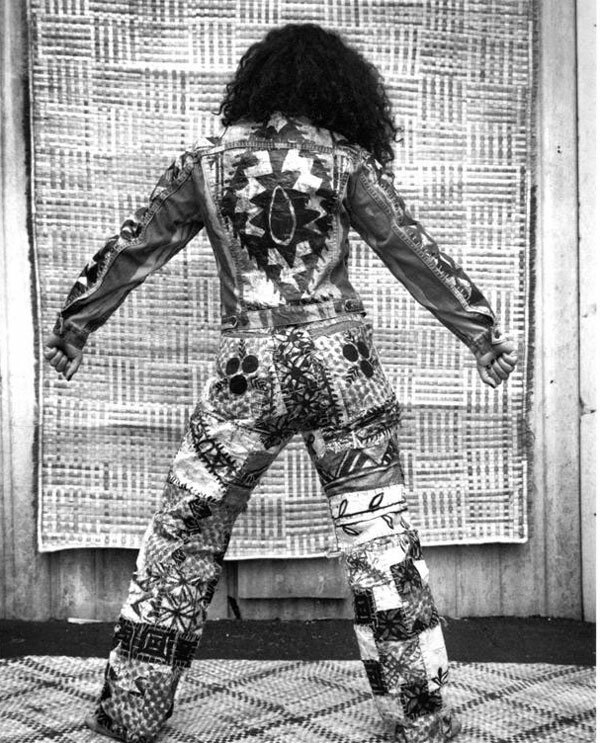 I started to study local fashion styles back in 1974 and created "cross-over" clothes. Have a look at our World Clothes for Equal Dignity idea, for which I still look for support. Unfortunately, I no longer have time to be my own tailor, and the dress on the left side from 1981 is now very worn and in danger to fall apart and I repair it every year. Since I did not find the right material in Thailand in 2014 to make a good copy, I kept searching for it in other parts of the world. 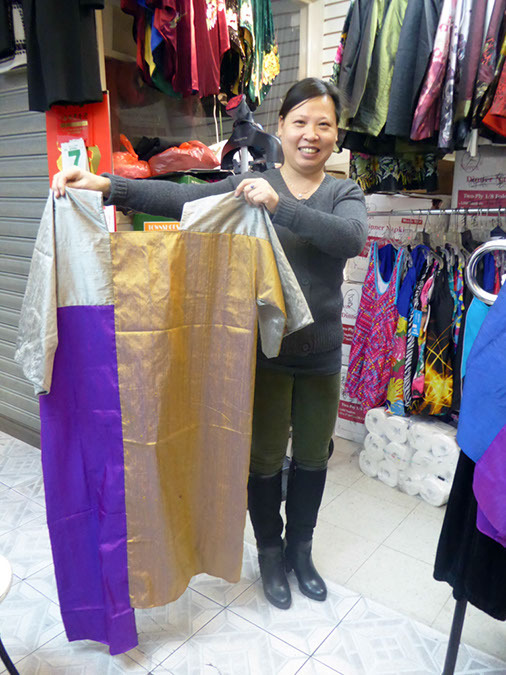 I was extremely happy to find the right material in the very last corner of the fashion street in New York in December 2015! (Foursquare Favorite, 224 West 40th Street.) 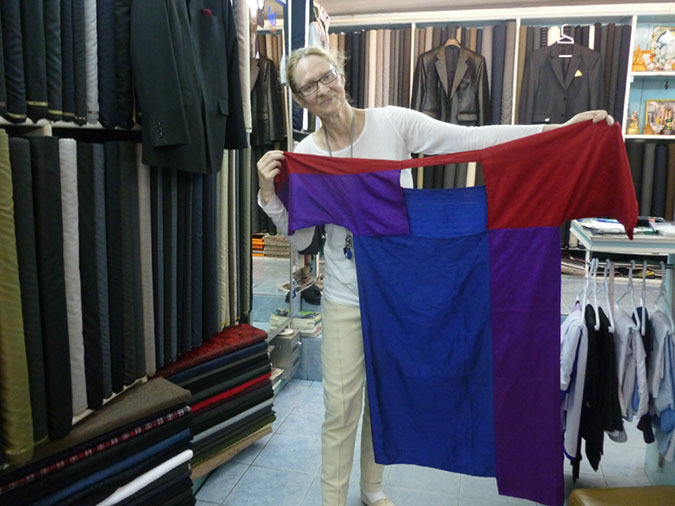 I brought this material with me to Sarajevo and the lovely tailor Senida has now been so kind, in August 2016, to make a copy of my 1981 dress! See the photo on the right side. Senida is originally from Italy and she became very proud of the "unikat" as she called my dress. She has proudly put a photo of it up on her Facebook page! • Please click on the photo above on the left side to see it larger. Click on the photo above on the right side or here to see more pictures of Senida's little atelier in one of the backstreets in the center of Sarajevo. In November 2016, my 1981 dress was copied in New York by dear May Cheng! 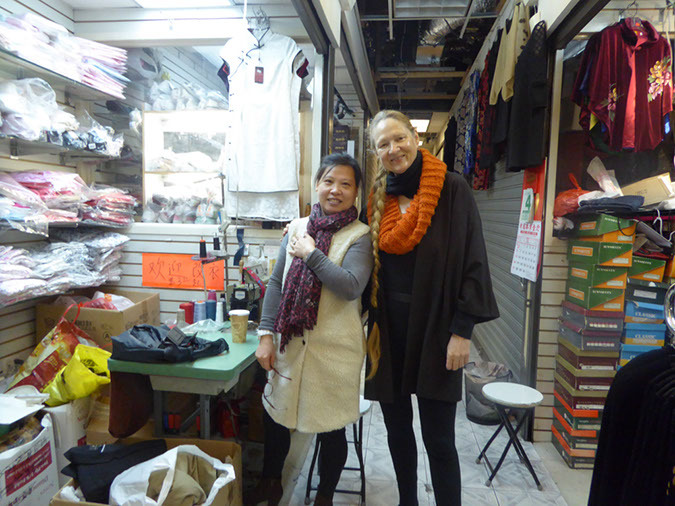 • Please click on the photos above or here to see more pictures of May's little atelier in Boweri Street in New York's China Town. An important point for HumanDHS is to deconstruct tradition, in this case traditional clothes design. We do not wish to accept everything as it is. Many aspects do not bolster our aim - equal dignity for all. Chinese footbinding is a drastic example of how women were intentionally mutilated and handicapped in order to fit into an image of feminity as cuteness and helplessness. We do not wish to preserve those aspects of tradition. Many clothes for women, both traditional and modern, carry "footbinding" aspects, in contrast to clothing made for males. Women typically can not breathe freely or walk forcefully. Corsets created a wasp waist that made women almost faint, Japanese kimonos and to a certain extent also Chinese qipaos have similar effects and hinder free movement, as do many modern clothes. Modern shoes make women walk in ways that signal fragility. Feminine beauty, elegance, and decency are conceptualized, in ways of méconnaissance and naturalization (Barthes, Bourdieu, Foucault), as lack of forcefulness. We wish to encourage women to opt for new definitions of beauty and elegance, definitions that lend them strength and power. Clearly, future-oriented design entails more than just design. It means also awareness for fair trade, respect for the people who produce products, in this case clothes, and more personalized relationships between products and users. 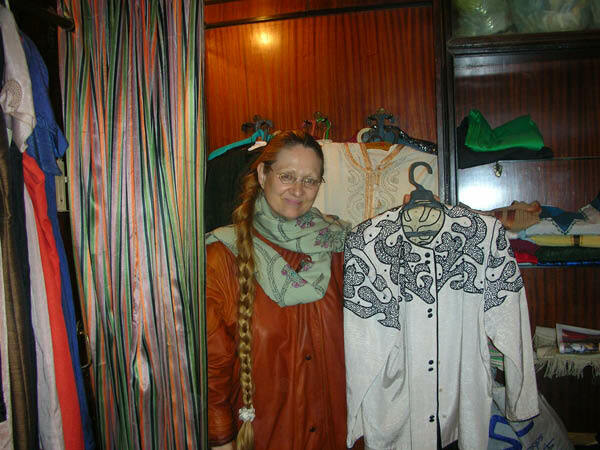 Starting about 30 years ago, Evelin Lindner began to make clothes from materials she found around the world. 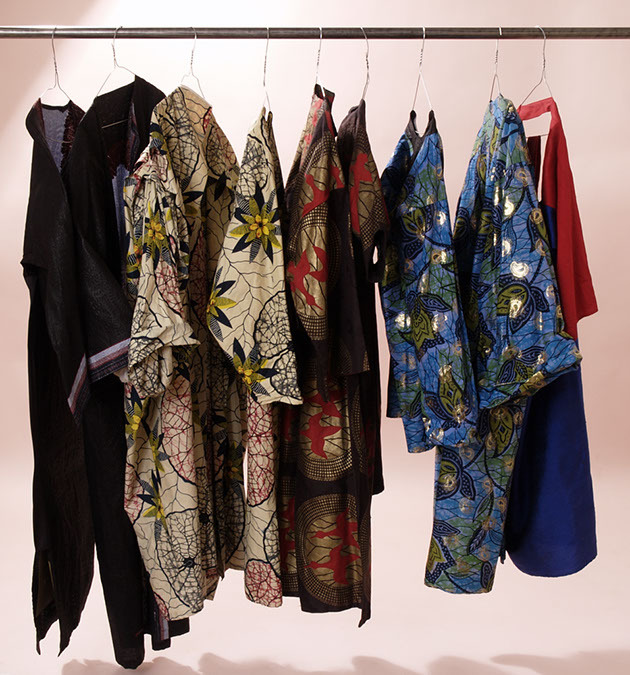 She has subsequently developed a collection of clothes that combine materials and styles from different cultures in original ways, thus embodying cross-cultural fertilization. She always received ample attention when wearing her unique clothes, indicating, that seemingly, not only she, but many people around the world yearn for more diversity in clothing styles and for a greater variety of opportunities to express onself in distinctively individual and cultural ways. See her prototypes further down! HumanDHS envisions to make copies of the prototypes for interested people and give them away for donations that fund HumanDHS's research activities. We wish to engage in building the Fourth Sector also in our work. On the website of the Fourth Sector Network this is explained as follows: "Over the past few decades, the boundaries between the public (government), private (business), and social (non-profit) sectors have been blurring as many pioneering organizations have been blending social and environmental aims with business approaches. There are many expressions of this trend, including corporate social responsibility, microfinance, venture philanthropy, sustainable businesses, social enterprise, privatization, community development and others. As this activity matures, it is becoming formalized as a ‘Fourth Sector’ of the economy." See also KaosPilots. Each copy is envisioned to be personalized in a unique way and linked to information about cases where humiliation has been diminished successfully and with respect (thanks to Dan Braha for his creative input; as medium the quick chip might serve, currently developed by the Memory Spot research team at HP). The donations will be fed into the research activities of Human Dignity and Humiliation Studies, such as the funding of scholarships for doctoral students. Since Lindner's first ideas evolved about 30 years ago, she has discussed them with people in all parts of the world and from various cultural backgrounds. In these discussions, people have reflected on the complicated task ahead for humankind, namely to work for equal dignity for all people on the planet (this is the core message of Human Rights), and at the same time for less cultural sameness and more cultural diversity. Currently, globalization typically means but Westernization, the result being a rather uniform Westernized world where cultural diversity is being lost. Respect for the dignity of cultural varieties and local solutions is wanting. The complicated task at hand is to work for more egality (Lindner's word for equal dignity), and less sameness. Brigite Pages wrote down the following (2004, Tokyo): "L'universel est constitué de particulier, l'universalité de particularité. Comme l'univers de particules. Uniforme = forme unique, à l'intérieur des différences des cultures particulieres." The picture is taken by Evelin Frerk, www.evelinfrerk.de. Please click on the picture to see more. 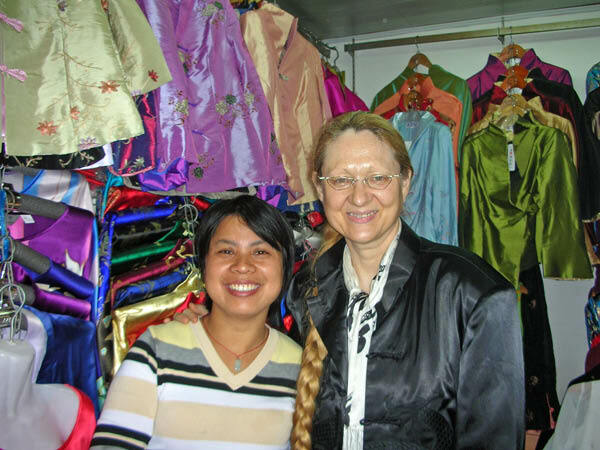 From left: Please meet Liu in Shanghai (April 2006), and the Abbas Higazi factory in Cairo (January 2007), or Conytex at Sekem (January 2007), potential links to tailors for our World Clothes for Equal Dignity project. Please click in the middle of the pictures to see them larger. by Jeffrey Warner in The News Lens International, 9th November 2017. This multimedia piece explores the way that some indigenous people in Taiwan — by weaving the techniques, colors and patterns of their ancestors with modern-style ‘catwalk’ fashion design — are re-invigorating and restoring their millennia-old cultural heritages. ... They are also challenging some assumptions about indigenous peoples and ‘traditional’ ways of life along the way. ARD-alpha Doku, D 2016, 45 Min. Als pakistanische Brandopfer den Discounter Kik verklagen, kommt einmal mehr ans Licht, wie deutsche Firmen in Asien produzieren lassen. Alle sind empört – aber wenn es ums Shoppen geht, interessiert Kunden als Allererstes der Stil, dann der Preis. Was kann die Politik tun, um Herstellung und Handel fairer zu machen? 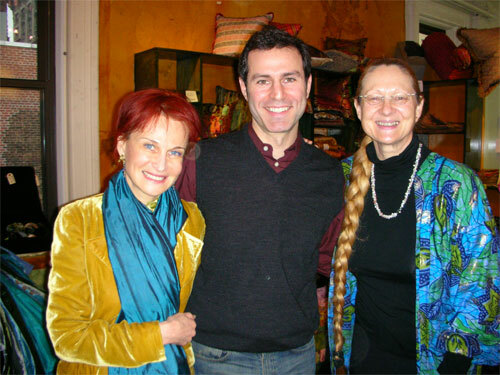 A project Martha Eddy is consulting with - clothes, furniture, and more from a sustainable and human perspective. 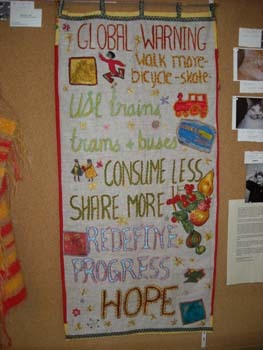 c) making reclaimed clothing via - teaching design basics; making t shitrts ; making skirts and pants - on a make one- sell one basis. Please click on the picture or here to see more photos. And see Karenza's blog here. See also the Community Arts Council of Vancouver (CACV). SECOND SKINS: Cloth and Difference 30 April 2009 at Iniva - Institute of International Visual Arts in London, UK. The Second Skins symposium looks at the way in which clothing is part of expressing our individuality. Like a skin, it protects us, connects us to - or distinguishes us from - one another, and communicates something about our beliefs, values and aspirations. Clothing and cloth can also be seen as a means by which to free oneself from societies’ constraints of social, racial and cultural conformities and hierarchies. Second Skins was instigated by Christine Checinska and is organised in partnership with Iniva with support from Goldsmiths, University of London and A Foundation. Please click in the middle of the pictures to see them larger. You see on the left side G’nang G’near (photo by Greg Semu, Rosanna Raymond), and on the right side the flyer for the exposition (with a film still from The Nightingale Grace Ndiritu, 2003, on top). Please read more at http://www.todayszaman.com/tz-web/detaylar.do?load=detay&link=162265&bolum=123. The CCC is an international campaign, focused on improving working conditions in the global garment and sportswear industries, and empower the workers in it. There is a Clean Clothes Campaign in 11 European countries. These are Austria, Belgium (North and South), France, Germany, Italy, the Netherlands, Norway, Spain, Sweden, Switzerland and the United Kingdom. Established Clean Clothes Campaigns are autonomous coalitions with NGOs (consumer, research, women's, fair trade and youth organisations, solidarity groups, churches, etc) and trade unions as members in European countries, each with a secretariat, and each sending a representative to the European Coordination Meeting. Countries (2008): Austria, Belgium - Flemish-speaking Belgium, Belgium - French and German-speaking Belgium, Denmark, France, Germany, Italy, The Netherlands, Norway, Spain, Sweden, Switzerland, UK. "...in this place, there is no boss banging over or taking advantage of us. There is no threat and insult. Most importantly, here is our own factory..."
The Solidarity Factory Cooperative was created by former Bed and Bath factory workers. This followed a three-month struggle by workers for payment of money owed to them, following its unexpected closure in October 2002. In 3 years, Ethical Fashion Show has become the must see event not only for buyers but also for all those searching for something different. Please read more at http://ethicalfashionshow.com/langues.htm#.